This is different from the two common calculator functions used to find the arctangent: Arctangent and Argument. The complex number x + yi is used. I hope this tip is helpful. Happy Thanksgiving and I am very thankful for all who have read, followed, and supported my blog over the last two years. This session will show how routines work in HPPL. Generally, subroutines have be declared before the main program. Declaration is important. The details of the subroutines are after the main program. Definitely take a look at the example programs to get a better understanding. We will use Φ as the subroutine. * Remember century years not divisible by 400 are NOT leap years. This program does not take this into account. If any such years are passed, subtract one day for such year manually. 1/5/2015 to 3/19/2227 returns 77,506 BUT this program treats 2100 and 2200 as leap years, which in reality they are not. Subtract 2 to get the correct answer of 77,504 days. So that is how subroutines work. Please give comments, ask questions, and always thanks to my supporters and readers. Cheers! Today's session is about starting other apps in a program and using colors. The equation must be a string and be stored to the appropriate designated variable. F# is for functions of X. (Function app). 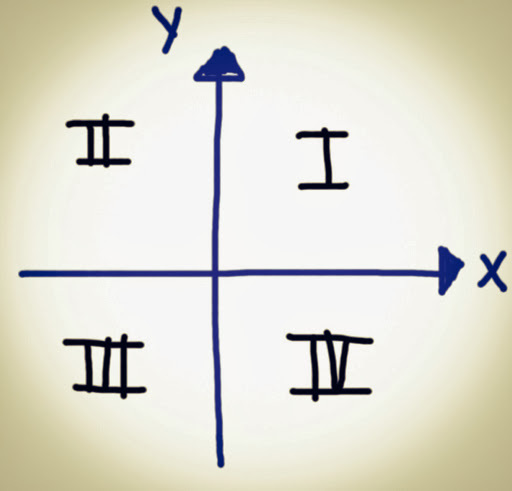 R# is for polar functions of θ. (Polar app). U# is for sequences of N, N-1, N-2. (Sequence app). 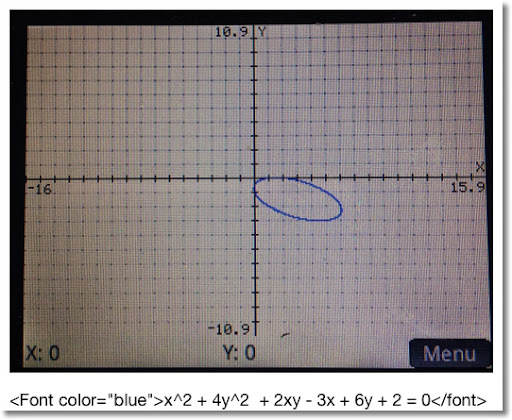 V# for open statements and equations in the Advanced Graphing App, which The independent variables are X and Y. # is a digit 0-9. Defining equations this way leaves them uncheck. If you want them plotted or accessed in Num View, you will need to check them. F1:="2*X^3" stores the function f(x) = 2*x^3 in Function 1. R5:="A*SIN(θ)" stores the polar function r(θ) = A*sin(θ) in Polar Function 5, with A being what value stored in it. Starts the named App. 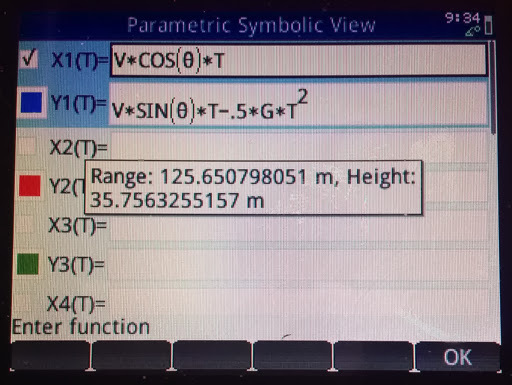 The calculator points the screen to the default view (Plot, Symb, Num). 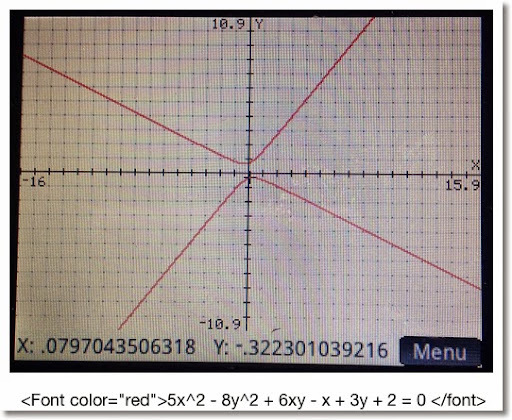 Checks and unchecks specific equation or function (0-9) in the current app. For example, if you are in the Function app, CHECK(1) activates F. As you should expect, UNCHECK(1) turns F1 off. What does CHECK and UNCHECK affect? 1. Whether a function is plotted in Plot view. 2. Whether a function is analyzed in Num view. Instructs the HP Prime to go to a certain view. It has two arguments, the view number and a redraw number. The redraw number is either 0 or non-zero. 0 does not redraw the screen, anything else does. I recommend the latter. Returns an integer code pertaining to a color's RGB code. This is super useful for drawing and text writing. Alpha: (optional) Opacity (up to 128). For other colors, RGB can be found on various sites on the Internet, including Wikipedia. 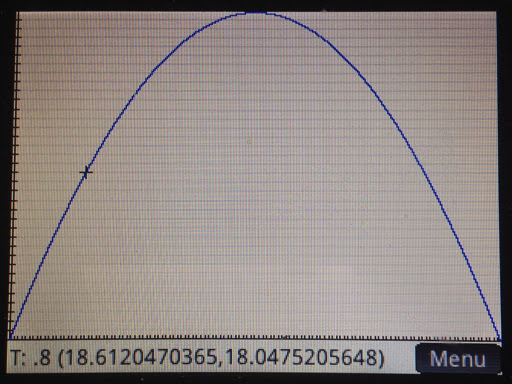 # is the digit 0-9.
makes the function F8 plot in blue. This is a lot, but this is doable. Let's see all these commands and tips in action and create some magic. 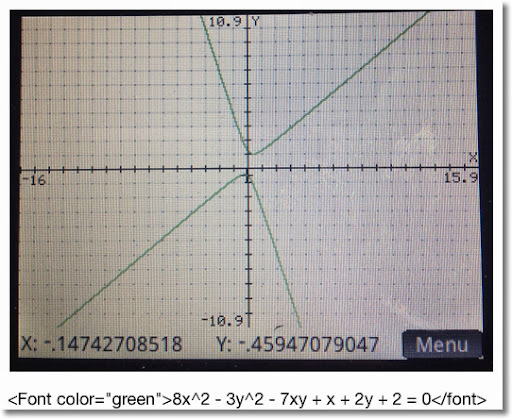 You can choose the color how the conic section is plotted, from red, blue, orange, and green. (Game show enthusiasts take note of the order of the colors I listed... ;) ). This program calculates range and height of a projectile, and plots its path. 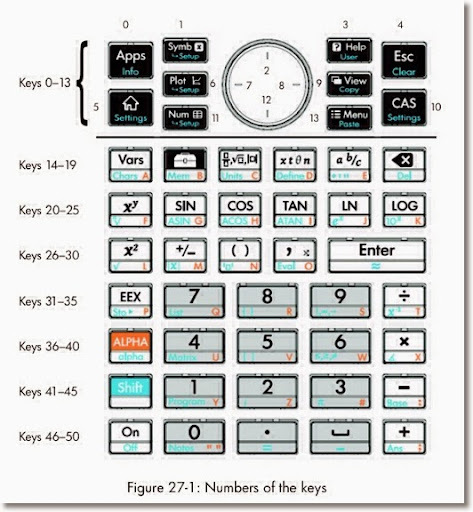 The program sets the mode into Degrees (HAngle=1) and the calculator to the Parametric app. Air resistance is not factored, so we are dealing with ideal conditions. How much the projectile represents reality varies, where factors include the object being projected, the temperate and pressure of the air, and the weather. 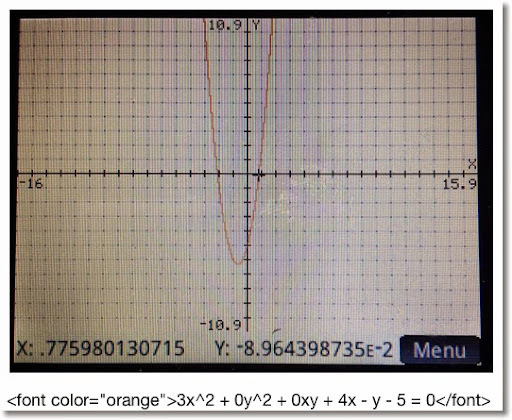 Below are screen shots from an example with V = 35.25 m/s and θ = 48.7°. This concludes this session of the tutorials. Shortly I will have Part 6 up, which has to do routines. Welcome to Part 4 of our programming series for the Prime. Today's session will cover CHOOSE and CASE. First a tip from Han of the MoHPC Forum, which is found at http://www.hpmuseum.org/cgi-sys/cgiwrap/hpmuseum/forum.cgi#255084. Thank you Han for allowing me to share this. Use the IF THEN ELSE structure with INPUT to execute a set of default instructions if the user presses cancel. INPUT returns a value of 0 if ESC or cancel is pressed, and 1 if a value is entered. Default values can be assigned to values as an optional fifth argument for INPUT. Again, major thanks to Han. Choosing item 1 assigns the value of 1 to var, choosing item 2 assigns the value of 2 to var. CASE: Allows for different test cases for one variable. Also includes a default scenario (optional). Let's look at two programs to demonstrate both CHOOSE and CASE. That is how, in general CHOOSE and CASE work. I thank you as always. It is so good to finally be rid of a cold and firing on all cylinders again. HP Prime Program: TARGET. TARGET is a game where you provide a guess to get a desired number. If you miss, the calculator will tell you if number is higher and lower. At the end of the game, the calculator gives you how may picks you needed to get the target number. WHILE: Repeat a number of commands while a specific condition is test. Caution: Watch your ENDs! Make sure an END is with each loop and the program itself. Press the soft key Check to check your work. INPUT: Creates an input screen for variables. On the HP Prime, the input can asked for more than one input. TARGET demonstrates INPUT with one prompt. Note: Pressing Cancel will store a 0 in variable. You may include code of what to do if the user presses Cancel, but it is not required. KILL: Terminates program execution. Nothing dies, I promise. 1. Add a limited amount of guesses. 2. Can you display the list of guesses? ULAM Algorithm: take an integer n. If n is even, divide it by 2. If n is odd, multiply it by 3 and add 1. ULAM counts how many steps it takes to get n to 1. CONCAT(list1, list2): Melds list1 and list2 into one. Message Box: "NO. OF STEPS=6"
Message Box: "NO. OF STEPS=16"
The next section will introduce a super-important command, GETKEY. We will be working with GETKEY over the entire series. The Program KEYNO: The person presses key presses. Which each key press, the code returns to the terminal screen. The program terminates when the Enter key is pressed. Keep in mind this works with created user programs. To ensure that built-in commands work correctly, still include the number of arguments as needed.